A critical part of getting up to the mountain for a day in the snow is, well, being able to get your skis and boards there! ReRack sells new and used ski racks, cargo boxes and other gear from top manufacturers including Thule and Yakima (the two main brands). We also carry one of the widest selections of replacement parts and older, discontinued models. The two main ways to carry your snow sports gear is with a ski rack or cargo box. Both are good options, and the choice will depend on your budget and needs. Regardless of your choice, you will always first need a base roof rack system (with very limited exceptions) in order to mount a ski rack or cargo box to your vehicle. Here are the main pros and cons of both cargo boxes and ski racks. Cargo Box Carry more gear - poles, boots etc. Protected from the elements More expensive - $300-$700+ Carry more gear - poles, boots etc. Many people consider a roof top cargo box to be the 'best' solution for carrying your skis and boards up to the mountain. Most cargo boxes will have enough size so that - in addition to your skis/boards - you can also toss in your boots, poles and other dirty, wet gear - keeping it all out of the car. In addition, putting your skis and snowboards in a cargo box keeps it from getting road salt, mud etc. on them (this may or may not be a big deal for you). Plus cargo boxes are great for your camping gear, road trips, and any other trip where you need extra space. If you plan on doing a lot of trips in the spring, summer or fall, then a cargo box should definitely be a consideration for you. Do note that a roof top cargo box is not small! These are basically big, lockable plastic 'shells' and if it's not on your car, you will need someplace to store it. They also add significant height to your vehicle - so don't run into your garage or a low roof with it. Last point to mention about cargo boxes is that, depending on your vehicle, you may or may not be able to open the rear hatch fully with the cargo box on. Low Profile: These cargo boxes are designed for skis and snowboards (short in height, long length). Best choice if you're concerned about space. Probably the most popular option for carrying your skis and snowboards. The biggest advantage over a cargo box is the price. A cargo box will run you about $300-$700+ depending on your choice. Ski racks start under $100 (or even less for used ones) and top out around $275 for the latest, fanciest models. These prices are in addition to the base roof rack system you will need. Ski racks mount to your existing roof cross bars, so make sure the one you're looking at fit your crossbars. Most new, current generation ski racks have 'universal' mounting hardware, but a lot of older systems will only fit Yakima round bars and Thule square bars. If you've got an older vehicle with factory crossbars, be sure to check out Yakima's MightyMounts for older ski racks. All ski racks function in the same basic manner - an upper and lower clamp/arm attached by a hinge, with cushioned pads on the inside. Your skis will be sandwiched together, and snowboards should be attached with the bindings facing up. If you're maxing out the ski rack with snowboards the decks will be sandwiched together, so put the shorter bindings facing down. Ski racks come in two basic sizes: a 'small' size that can fit up to 4 pairs of skis or 2 snowboards, and a 'large' size that fits up 6 pairs of skis or 4 snowboards. Different brands use different naming styles, but if you see a '6' in the title it is the large size, and '4' is the small. One issue that sometimes comes up with ski racks is the the bindings line up right where the two ski mounts are, so you're unable to close the ski rack. You have two options here: adjust the crossbar spread, or if that's not possible move the board forward (towards the front of the car) until the bindings are out of the way of the ski mounts. There's not a lot of replaceable parts on ski racks - mostly the locks and keys, and the mounting hardware. ReRack stocks spare parts for ski racks from Yakima and Thule. 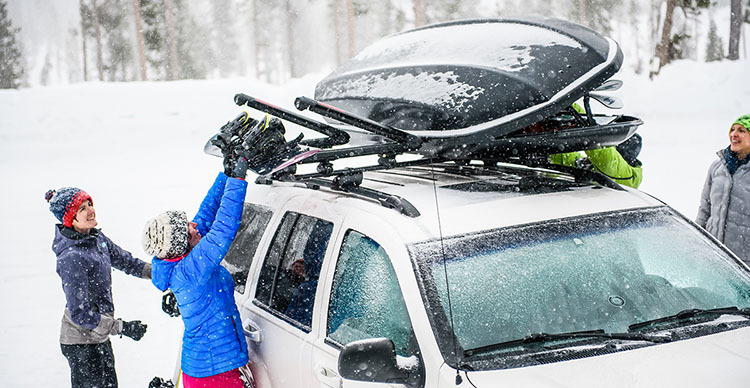 Yes, you can carry skis or snowboards without have a roof rack system on your car. The two main options: a dedicated roof ski rack, or a hitch mounted ski rack. Dedicated ski racks are just what they sound like - a dedicated roof rack that will ONLY carry your skis/snowboards (and fishing poles). If you don't have a roof rack and don't plan on doing anythings besides snow sports, a dedicated ski rack may be a good option for you. We have multiple models available, but make sure to confirm the vehicle fit before buying! There is no such thing as a 'universal' ski rack that will fit all vehicles. Hitch mounted ski racks let you carry skis/boards vertically on the back of your car. 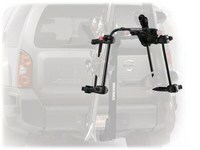 A hitch mount ski rack REQUIRES you to already have a hitch mounted, hanging-style bike rack. A hitch ski rack sits on top of the bike rack arms - they will NOT work without one.